Frugal Creativity: What Have You Done For Me Lately? A UPS guy NEVER brings bad news. It's nothing but gifts, clothes, and stuff from amazon you treated yourself to. All positive things. A UPS guy is like Santa Claus -- Pure joy is being delivered. They bring us good stuff. I'll add one more reason that seems to follow the same logic: They never ask anything in return. So--again, I'm exploring this theory and not suggesting that this is a universal phenomenon--some women like UPS drivers because of what they give, and because they don't ask anything in return. It's essentially a one-way relationship. Now, I am in no way equating God with a UPS driver. But how many of us--at least sometimes--value God only because of what He gives us? How often do we neglect to adore Him for who He is, and focus only on what He does for us? I think that our personal testimonies have to be, well, personal: the way that God called me to Him and what He has done in my life is a story that I can only tell from my own perspective. But in our own worship time and in our own hearts, do we focus on the blessings that God gives us, or on the pure majesty, power, and love that define Him? What a wonderful post. God has given me my very life, he is my best friend, he is an awesome God. When I think of the pure love He has for us my heart wells up and I cry tears of joy. Thank you Abba for your majestic being. Good thoughts...very good thoughts thanks for sharing them with us. This made me laugh. I used to really like my Swans guy..but he was a little odd. then he started charging extra for gas and I didn't like him anymore. ha ha ha. We are so temporal! And I can totally see how you can relate that with God. We do love God when we think life is great and we see so evidently His gifts, but then we get mad at Him when we lose people or possessions or comforts. We get angry and say, "why did you do this to me. You don't love me". But in fact, that very thing that He is doing IS in fact a loving thing. So hard to see God that way, but its so true. He always does what is best for us and always loves us no matter what it looks like. We can't understand God so we should just really stop trying to be Him. JDaniel loves it too. Yes Ma'am was something I didn't say and most of my friends her don't have their children say. JDaniel will stand out it a good way I think. My UPS guy has brought bad news, but overall I do look forward to the UPS truck. On the other hand, my dog does not like the UPS truck. As soon as he hears it coming, he starts to growl. lol! Excellent post! I usually like the UPS or FedEx guy.. but my dogs really don't like them at all lol.. they don't appreciate the good things they bring! Love the analogy. Fabulous post. 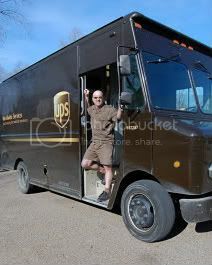 I can't resist mentioning that my regular UPS men are friendly - like you said - but every once in awhile I get one (the same one) who is so grumpy or something. He doesn't even smile at my children or offer a verbal greeting as they wave and yell. What a true statement, being a fair weather believer :). Only if we really looked around there is always smaller things around that you need to appreciate. My daughter thinks everytime the Ups man comes he has a gift for her! So she'd agree with the Santa Claus link!